For your convenience, we’ve collected the important reference manuals you might choose to examine for your pool equipment. We’ve also included a quick reference guide, Pool Chemistry 101, and answers to some frequently asked questions to give you a quick introduction to the pool terminology and processes that you’ll hear a lot about when you own a pool. We’re happy to help you stay informed about your pool. Anytime you have questions, please get in touch. Our expert service technicians are looking forward to helping you. Were you paying attention in those high school chemistry classes? If not, here’s a brief refresher course. The most important factor for enhancing the life and appearance of your swimming pool is proper water balance. The major levels to check regularly are pH, total alkalinity, calcium hardness, and chlorine. Making sure that these four elements are properly maintained will do a lot to increase the enjoyment you’ll get out of your swimming pool. One of the most important things to check regularly is potential hydrogen, or pH. This is a measure of the water’s acidity and is measured on a scale of 0 to 14 with 7 being neutral (kind of like the Swiss, but without the Army Knife). Ideally, the pH should be between 7.2 and 7.8, with 7.4 to 7.6 being perfect. Proper pH levels are important because they allow the other chemicals in the water to work efficiently. Chlorine especially is much less effective at high pH levels: at a pH of 8.0, chlorine only works at 22%. Additionally, both low and high pH can damage a vinyl liner. At low levels, the liner can stretch and wrinkle. A high pH can shorten the life of the liner. There are any number of things that can cause fluctuations in the water’s pH, including rain, swimmer wastes, and refill water. Alkalinity is a measurement of all of the alkaline materials that are dissolved in your water. You should maintain an alkalinity reading of 80-160 ppm to help the pH resist fluctuations. When the alkalinity is too low, pH is more likely to “bounce” in and out of range. The amounts of dissolved minerals in water are what constitute calcium hardness. When the hardness level is too low, corrosion of the pool surface, filter, heater, ladder, etc., can occur. A hardness level that is too high will cause cloudy water and scaling, giving the water a white chalky appearance, which you’ll need more than an eraser to correct. Stabilizer acts as a sun shield to extend the life of chlorine up to 3 1/2 times. It actually holds the useful form of chlorine in the pool water until needed, giving longer protection against bacteria and algae. It leaves no residue (100% soluble). “Stabilized” chlorine products (sticks, tablets, or chlorine powder) contain some cyanuric acid, which helps to maintain the proper level throughout the season. Warning: a cyanuric acid level that is too high (70+) can be harmful or fatal if accidentally inhaled by infants or small children. When water balance is not maintained properly, several problems can result. These include eye and skin irritation, staining and/or wrinkling of the liner, corrosion of metals, cloudy water, scale build-up on the pool surface as well as inside the filter and heater, and interference with the efficiency of your sanitizers. Unlike in cooking, it’s really not a good idea to just toss in amounts that you think sound right. It is usually best to add balancing chemicals to the deep end of the pool, or in front of a return with the pump running. The following are recommended methods for the most common adjustment chemicals. pH Adjustment: Add the recommended dosage, wait several hours, and test the water again. Maximum dose is 1.5 pounds of pH lower per 10,000 gallons every hour. After adding, wait fifteen minutes, then proceed to next step. Wait one hour after applying product to swim. Alkalinity: If the amount suggested exceeds 4 pounds per 10,000 gallons and metals are present, divide into thirds, pre-dissolve, and apply every four to six hours. Otherwise, add directly to the pool water by broadcasting around the edge of the pool. Wait two hours, then proceed to the next step. Wait one hour after applying product before swimming in the pool. Hardness: If the total amount of product recommended is greater than six pounds per 10,000 gallons, divide dosage into thirds and apply every six hours. Brush after each application to disperse any undissolved product. When high calcium hardness is causing cloudy water, drain one inch and refill with fresh water. Retest the water and continue to cycle the water until the level is between 125 and 250 ppm. Stabilizer: Start with a clean pool and backwash the filter. Make a slurry of stabilizer and water, and then add very slowly through the skimmer with the pump running continuously for at least 48 hours. Don’t backwash for 3 or 4 days after adding stabilizer. Check to make sure the pH levels are in proper range. Check the pool filter. Clean or replace if needed. Check the pool sanitizer’s level. If it’s low, raise the level. Depending on your usage, you should test the water frequently. Some users test the pH and chlorine every other day – others test once a week. During heavy usage and summer months, you can perform a daily test. Anytime you notice a change in water quality, get your test kit out and check the water quality. When do I need to clean my filter, and when to replace it? Periodic backwashing will remove most dirt from a clean filter; however, over a period of time, grease, oils, and scale can attack and build up on the elements. When this occurs, you should clean or replace your filter depending on the type of filter. NOTE: Check the filter if water is murky or water quality decreases. A clarifier is designed to aid efficient filter operation by coagulating most materials that cause cloudy and hazy water. Because the presence of these materials increases the disinfectant demand, the use of a water clarifier can decrease pool maintenance costs. Filtration is the mechanical way to remove visible matter from the water. The filter medium is designed to remove hair, dirt, tiny skin flakes, metal, or calcium precipitates and other visible debris that would otherwise cause the water to be hazy and cloudy. What does “Vacuum to Waste” mean? When you “Vacuum to Waste” you are pumping the debris you vacuum out of the pool and sending the water to the waste line, not through the pool filter. This method removes a large amount of water from the pool in a short time, so be sure the pool is full before you begin. Vacuum to waste is used for large amounts of debris and dirt. What is the best way to get rid of algae? First, you must add the algaecide according to the directions. If you don’t add the correct dosage amount, it won’t kill any of the algae. Also, you need to be aware that using the entire bottle of algaecide is ineffective. Not only will you spend unnecessary money, but large doses can lead to staining and foaming in your pool. In addition to properly dosing your water, it is also recommended that the algaecide be added in the morning on a bright, sunny day for best results. Algae grow in the presence of sunlight. Adding algaecide during algae’s best growth time will increase intake of the algaecide and make it more effective. If black algae is present, brushing the algae at least once daily will also help expedite algae removal. Brushing the dead cells away makes the living algae more vulnerable to the algaecide. Pool water composition always includes some undesirable elements that actually contaminate the water and reduce the efficiency of the disinfectant or sanitizer. Materials such as hair spray, suntan oil, cosmetics, perspiration, and other organic material react to combine with the chlorine in the water to form “combined chlorine.” Once “combined chlorine” forms, it acts as a very poor disinfectant, contributing to eye and skin irritations and the forming of that unpleasant chlorine odor. Pools with this problem are often inaccurately accused of having too much chlorine. Routine shock treatment is necessary to destroy combined chlorine compounds and restore the chlorine sanitizer to “free chlorine” efficiency. A pool can be shock treated by adding large doses of chlorine, commonly referred to as superchlorination, or by adding a non-chlorine shock such as GLB OXY-BRITE or Applied Biochemists SHOCKTRINE. How do I get rid of that chlorine smell? Most pools contain both good chlorine and bad chlorine. The good chlorine is called free chlorine and is capable of killing germs. Bad chlorine, on the other hand, is called “combined chlorine” and is a poor germ killer. Too much combined chlorine in your pool causes the strong chlorine odor. When the combined chlorine level reaches 0.2 ppm or more, it is time to shock your water. Shocking will eliminate the odor. How long before I can jump back in my pool? Any other questions? Just let us know! 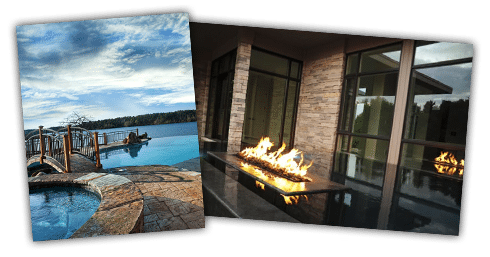 We understand the unique needs of pools in our community because we’ve been Little Rock, Arkansas pool contractors and builders for decades. Give us a call at (501) 448-2053, send us an email, or fill out the quick form to schedule an appointment with a service technician.